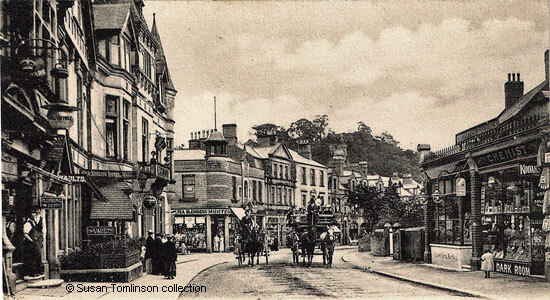 The top photograph of Dale Road, featuring the Old English Hotel, is fascinating. It could almost be called "The Story of the Ladder". The picture was taken somewhere between 1902 and 1906 when another version of this card was posted. At first glance the cart, in which a young man is sitting looking at the photographer, could be a window cleaner's cart. There's man at the top of the very long ladder who seems to be busy cleaning the windows of the Old English Hotel. He isn't. He has no bucket and seems to have no tools. His left hand is pointing to the bottom of the window frame and he's holding on with his right hand. The window is slightly open, opening in the middle into two halves. The workman is believed to have been a local Councillor named Harrison who worked for Hall & Co. and who was looking at the window frames prior to painting them. Hall and Co.'s "Plumbing Dept" was just off-photo on the left, next door to the Old English and its Vaults - in the second image the sign is just above the heads of the two young men who are standing in the shop doorway. To the left of the street lamp (top image only), but next to the buildings, is a large lamp with a white globe on which are the words "GAS OFFICE". Robert Hall, accountant and local entrepreneur, was a shareholder and secretary for Matlock Gas Co. which probably explains why it was there. Hall seems to have been a successor to Job Smith and very involved in Matlock affairs. The extremely long ladder, which was owned by the Old English, had virtually no rungs, or very few. There are actually two ladders, with a smaller one at the bottom to extend the height should it be necessary. The longer of the two ladders is not touching the ground. On this occasion it seems the second ladder was also acting to counterbalance the weight and add stability as painters always had someone standing on the bottom rungs (or they did later on). Whilst it is difficult to tell, the side of the ladder next to the workman's body seems to be fractionally longer and could just be resting on the bottom part of the window. It is impossible to know, even by blowing up the image as has been done to provide this description. The top left of the ladder is hardly resting on anything, just the moulding on the building. Arthur Wall, a keen cyclist, was the licensee of the Old English from the early 1890s until 1908, and was in residence when the pictures for the two postcards shown here were taken. His name is on the hotel sign, which is above the small garden that is surrounded by railings. On the day he was buried many businesses suspended trading for a couple of hours and there were crowds outside both the Old English Hotel and the Parish Church. He was succeeded by Victor Nicol, who married Arthur Wall's widow, and Francis Smith took over from him. My (web mistress) great grandfather, William Clay, was at the Old English during the First World War. Arthur Wall's name is on the Old English Hotel sign. It is at the right hand end. "Shortly. Matlock. The old-established Hotel known as "Ye Olde English" and Oriental Cafe adjoining ; also 10 valuable freehold plots." It is not known if the sale ever took place. Hunter's Grocery Shop is on the opposite corner and next door is the shop unit occupied for some years by Basque, the tailor. Whether Mr. Basque was still in business is not known as he last advertised in 1908. However, the sign on the window is the same as one in another photo on this site. It is not possible to read which solicitor was using the offices in Hunters Buildings although in 1916 it was Frederick William Gill. The shop next door to Basques, DYERS, is a puzzle. In 1908 an Albert Edward Dyer was assistant sup. Prudential Assurance Co. Limited and living on New Street so this could be his shop or a that of a relative. Unfortunately, there isn't enough evidence to help. There's a sign on the window, but it is mostly obscured by the carriage. There's no sign for the next premises. Then there's Evans', the jewellers. On the right hand side is a row of single storey shops, "Coronation Buildings", which were presumably named to commemorate the Coronation of Edward VII. Although unreadable on the top picture, it can be read on the sign over the butchers in the second image. The butcher's shop was the London Central Meat Co. Limited (LCM). Whilst there is no sign with their name on it, the chemist's selling Kodak film was Pilkington's. The sign, jutting out on the left of the chemist's, advertises table waters is possibly reads G. WRIGHT, TABLE WATERS and below the main window is a sign advertising a "DARK ROOM". Next door, the shop that is shut up (top image only), is Bradley's Clothiers and then the International Tea Co.'s Stores Limited. To return to the top picture, someone was even digging up the road opposite Hunter's Corner. But it was the ladder that everyone was looking at with such great interest, apart from the workman's "mate". 1990s photograph of the Old English, showing this striking building before it was extended at the rear. 1. 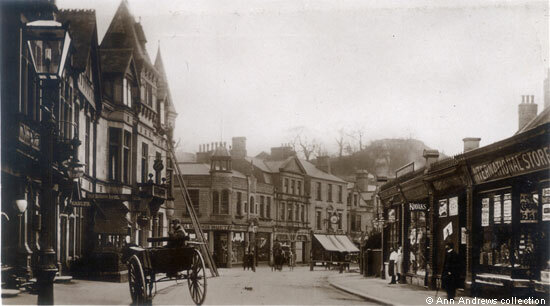 "Dale Road, Matlock". No.4022. No postmark, although I have seen another card of the same view postmarked 1906, so it points to the photograph having been taken well before my great grandfather's time at the Old English. Postcard in the collection of, provided by and © Ann Andrews. 2. "Dale Road, Matlock". Artistic Publishing Co; Series No. 2598. Not posted. © Susan Tomlinson collection. 2. 1990s photograph taken by and © Susan Tomlinson. With grateful thanks to Colin Goodwyn for his input. In 1908 Mrs. Annie Wall held the license. Her husband, Arthur, died in Matlock on 7 January 1908 and was buried at St. Giles on 10 January. "Belper News", 24 January 1908. Well-known Derbyshire Landlord. He was the Licensed Victualler at Ye Olde English Hotel at the time of the 1911 census. Mr. Smith was shown there in Kelly's 1912 Directory. The license was transferred to him in June 1911. It was said that he was previously of the Post Office Hotel, Darley ("Derbyshire Times", 7 June 1911). 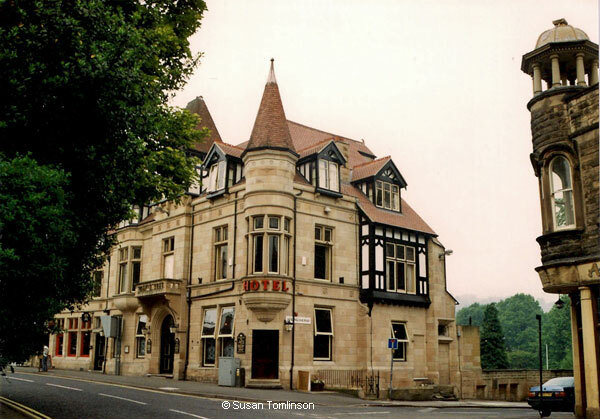 The first evidence I (web mistress) have found of the cafe's existence was in 1902 when the Oriental Cafe Matlock Bridge used as a venue for the Hockey Club's general meeting ("Derbyshire Times", 24 May 1902). Frederick Dalton is shown as the proprietor in Kelly's Directory 1908 | Kelly's Directory 1912 | Kelly's Directory 1916. He was also linked to the Central Restaurant in Matlock Bath. He can be found in Matlock Bath in the 1901 census. "Derbyshire Times", 20 May 1914. Kelly's Directory 1908. The front of Basque's shop can be seen on Matlock at the Beginning of the Twentieth Century. Gill's business letterhead of 1913 is elsewhere on this site.